For Mobile and Desktop viewers from the homepage-- I'm trying a new HTML Slideshow program, so if it doesn't load, please click on the title of the post. This week we will be looking at an A&P store that will always be close to my heart. Although I never shopped here when the store was open (ironically), I feel a very close attachment to the store and employees, partially the fact that this was my local store (even though it was two hours away), and that it was practically untouched since the store opened. I toured this store in November 2015, during the fixture sale. 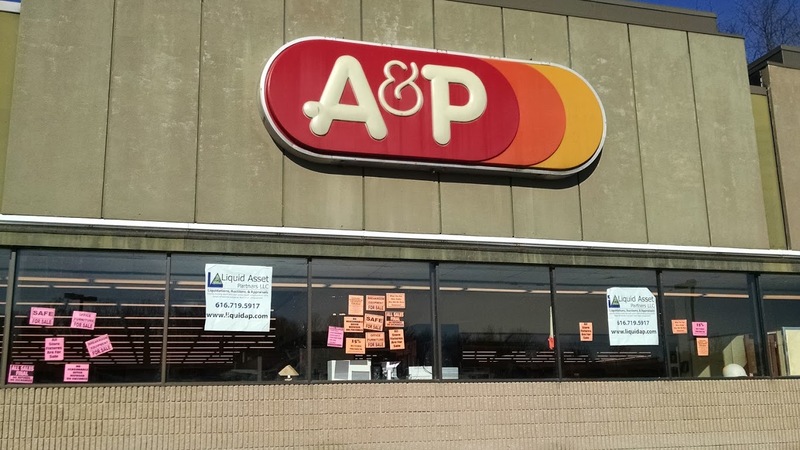 I not only got my hands on an A&P exclusive Chabaso bread sign, but an A&P Fresh Produce sign ("Fruit By The Each"), two A&P logo aprons, many "A&P PAID" stickers, and a vintage "Employees Only" sign. I was also planning to buy a few of the aisle markers also, but they were either all reserved or taken already. I remember when I was leaving the store a box truck was taking away all the A&P carts from the store... except for the ones in the backroom that I photographed. Today this store is on the market for $5,000,000 (according to Loop Net a few months ago) ... Isn't that a little bit too cheap for a supermarket like this? There's a huge parking lot, almost 40,000 square feet of retail space, and no improvements needed in sight. Plus, the listing also advertises that there are pad spaces and room for expansion on the property, so if the new owners were willing to, they would sell part of the parking lot and put up a Dunkin Donuts, or maybe a Starbucks. I did some calculations on Google Earth, the store, if brought out 20 feet into the parking lot, could almost be doubled in size. To see this store when it was open, view Acme Style's post here. The slideshow thing would be cook, but because the photo name comes up, it takes up half of the picture, and I don't think there's a way to hide it. But this was a good post and I'm glad you reposted! Yeah.. in the preview I noticed the titles. Funny because I checked ''' titles'! Sorry about that. Yes, great pictures! But I also agree that the slideshow viewer isn't so great. Yeah, I won't be using it again any time soon. I like the longer-style posts anyway. I can put a lot more commentary in it. Just trying out options. That bread rack is from a Pathmark. They just slapped the Chabaso sign on top of it. Yep! I was trying to get the Pathmark sign behind it, but it wouldn't budge. It's a shame!